The focus of Synergy Mime is to provide a desktop robotic platform. While maintaining all the functionality of its big brother, the SWAN, Mime is compact enough to fit on your desk or shelves. Replacing the SWAN’s two large drive wheels is a solid weighted base that keeps Mime stable when even the largest of tablets are connected to it. 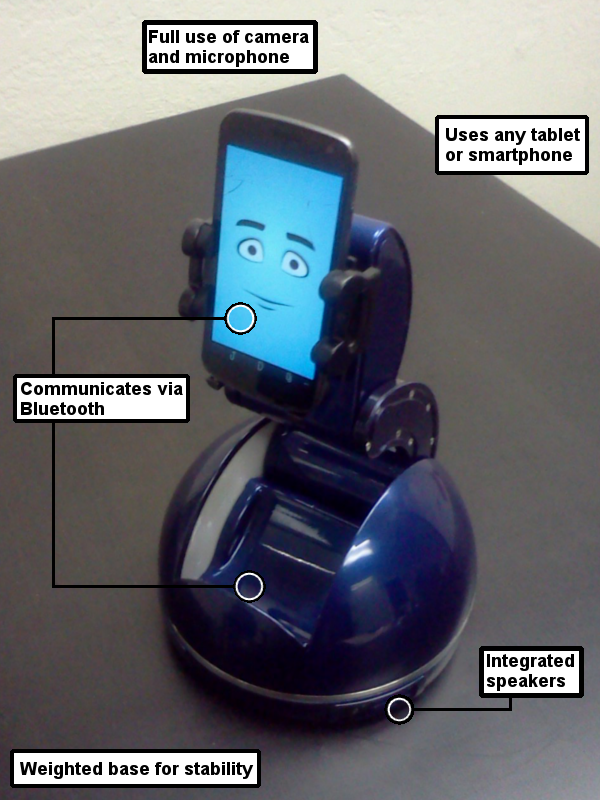 - Synergy Mime provides the most comfortable multimedia and internet content viewing with hands-free control, the robot responds to voice commands and tracks the user’s movement in order to change the position of the mobile device’s screen. - Synergy Mime is able to start a video, play music, or read a news article from the Internet. - As a Robot-Guide at the museum, the robot responds to a human entering the museum and will suggest that they look at the most interesting showpieces while displaying a map. - Synergy Mime is used in hospitals so that doctors can check on patients quickly and nurses can check vitals efficiently.